Welcome to the Westwood Fire Company Guestbook. Your feedback is important to us. Feel free to leave your comments. I would like to say that you all do a good job with all the things you guys do for the community. God bless you all. The firefighters did a great job yesterday. Excellent looking site! Love the blue apparatus, nice to see other departments with blue. Glad we are not alone! Words will never convey the message of the thoughts which embrace my mind. I am shocked to have learned of the passing of a LEGEND. My thoughts, prayers and heart are with Station 44's elite fire department, but also with all of the mutual aid departments, family and friends. I've had the pleasure of knowing Chetty as a friend and firefighter for many years and will only have kind memories to share. You will surely be missed, Chester!!! God bless you my friend! I am deeply saddened by Chetty's passing. But, I know he is in the better place. I admired him and all that choose to be volunteers that can walk into a burning building a save a life of someone they do not even know. I know that I am blessed to have spent time with his son. "Chetty" will be the next in line for an amazing journey. I pray for peace in the family. God Bless to all. "FREEBIRD," you got the send off you deserved. Rest in Peace. I'd like to thank the Westwood Fire Company for putting together an amazing send off for my Uncle Chetty. Although it was a sad day, the show of unity was very delightful. To all the other firefighters who attended, thank you very much for making my Uncle's day the best that it could be. He was a great person who we will all miss very much. Hey there, just wanted to send my condolences to everyone at Station 44 in the passing of Chetty Taylor. Got to know Chetty while active with Station 38. It's hard to say goodbye to a brother firefighter, especially when they're the same kind of person Chetty was. What a very nice and emotional tribute to Chetty Taylor. I am sure he would have been very proud! Salutations to all members of Station 44 who have battled the Coatesville fires and the adverse weather conditions to pay tribute to a very dedicated member. Of all.... Chetty would have appreciated that despite snow, sleet, rain and cold.... emergency responders get the job done regardless of conditions! He was certainly one who faced these conditions many, many times. I was deeply saddened to hear of Chetty's passing, he was a very special person. I have fond memories of him and the Westwood Fire Company . My thoughts and prayers go out to you all. I would like to thank everyone from the bottom of my heart for the beautiful service given to my uncle Chetty. He will be very missed by us all. I will forever cherish his last words spoken to me at the hospital. Chetty had touched so many people's lives in so many ways. Thank you again, all for all your prayers, and may we continue to pray for Chetter, Karen, Enda, and Cathy. Thoughts and prayers please be with the family, friends, and the brothers and sisters of the Westwood Fire Company from the hearts and souls of the Lower Swatara Fire Department. May God be with you now. I just want to say that the service was beautiful today, giving well deserved honor to a great man. My thoughts and prayers will continue to be with the Taylor & Westwood Families! I am shocked and extremely saddened to hear of ol' Chet's passing. He truly was a great person both in and out of the Fire Department. I still remember his Federal Q on his Ford pickup going down Route 30 business screaming to a call. About 30 years ago, Chetty came to our house to fix a broken water pipe. We were discussing what had to be done and I looked down only to see Chetty's shoe laces on fire!! I was ready to douse him with water when he nonchalantly bent down and put the fire out with a few drops of his coffee!! We will always remember the smile and the humor. He was a good man and will be greatly missed for a long, long time. Ladies and gentlemen, I am very sorry to hear about the loss of one of your Chiefs. My wife and I will hold you in our prayers. Please keep your heads held high, because your Chief would want you to keep your heads up and walk proud. God Bless you all and be safe in what ever you do. I was born in Coatesville. Sorry to see that all the fires made the National news. My best to all the firefighters who risk their lives every day. Coatesville is a very beautiful and pleasant place. I hope it will be that way again. Great tribute to a man that apparently gave a lot to his Company and community. These are the kind we miss so much. My sympathy and prayers to his loved ones. when I joined. He was a great teacher. I will miss his smile. Thoughts and prayers are with your Assistant Chief's family and the entire Westwood family. The entire firefighting community is behind his family and your company. You may have lost a member but you have all gained a guardian angel, so he may not be there in person but he will always be there in spirt watching over you when ever you need him. God Bless all of you and stay strong!!! Chetty was an amazing person in the fire service and outside of it too. He will always be missed. My thoughts and prayers are with him, his family, and this station. Our thoughts and prayers are with the family at this time of sorrow. Westwood has lost a very special person and he will be missed deeply. My thoughts and prayers are with all the family and friends that Chetty has left behind! We were all blessed by his presence and have lost one of the best! I will always remember his smiling face and kindness! Please watch over us and keep us safe! Rest in Peace Chetty! My sincere condolances to the family of Chetty. I was hoping to be able to come and pay my deepest respects, but do to a previous medical appointment, it will be impossible. My thoughts and prayers will be with you all. Our family will miss Chetty deeply. He was a life long friend of mine and will never forget him. GOD BLESS HIM AND HIS FAMILY. I just wanted to say Chetty is a great person and will be missed very much by all who knew him. I knew him since we were in 1st grade, what a guy. He was always a friend and a good person. My heart goes out to his son and friends and to the firehouse. Also, the Memorial Site on your website is very emotional and touching. Thank you for doing such a wonderful job expressing the loss of Chetty. We will miss a good friend, and every one in the area will miss a good man that never said no when asked to help (friend or stranger). All will miss him; our prayers go out to the family and Fire Company. Thank you Chetty just for being you all these years. My thoughts and prayers go out to Chetty's family and friends. He is a great man that will be deeply missed. God Bless. 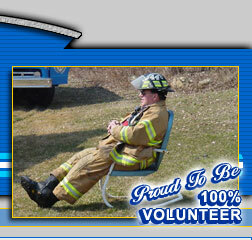 Rank/Title: Assistant Fire Chief - Elizabeth Twp. Fire Dept. To all, since I found your new website a few years ago, it has been a daily "chore" of mine to check up on what you guys are doing. I compare our company to yours in many ways; that's what sparked my interest. I feel that even though we have never met, I still know just a little bit about you guys. I just wanted to pass on my sincere condolences on the passing of Chief Taylor. Inside I feel as if I knew him and am saddened by the loss. Just wanted you guys to know you are in my thoughts and prayers. Please hang in there, I know its going to be a tough road, but Chief Taylor will be with you wherever you go. If you would need anything, dont hesitate to call, you can reach us at the website listed. Be safe and take care. Our deepest sympathies to Chetty's family and friends, and the entire Westwood Fire Comany community ... our thoughts and prayers are with you all. If there is anything at all we can do for any of you, please let us know. The Officers and Members of the Union Fire Company No. 1 of Oxford send our deepest sympathies, as well as our thoughts and prayers, to the Family of Assistant Chief Taylor and to the Membership of the Westwood Fire Company. Many of us knew Chetty and will miss him dearly. We are here for all of you. Please do not hesitate to call upon us during this time of need.